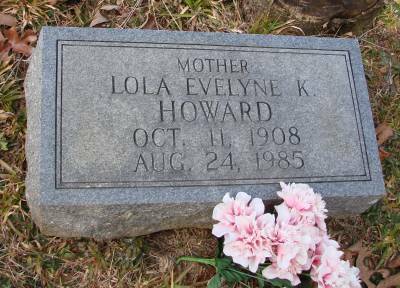 Lola Evelyn Knight, daughter of John Monroe Knight and Laura Ann Wilson, wife of William Andrew Summey and Benjamin Howard. Mrs. Lola Evelyn Knight Howard, 76, of 6310 Bells Ferry Road, Acworth, died Saturday, August 24, 1985 in the Woodstock Hospital following a lingering illness. She was a native of Cherokee County and a daughter of the late John and Laura Ann Wilson Knight and granddaughter of the late Mr. and Mrs. Ted Knight. A member of the Shiloh Hills Baptist Church, she was a homemaker. Funeral services were held at 2:30 p.m. Monday from the Owen Chapel with the Rev. Curtis Hammonds officiating. Interment followed in the Old Macedonia Cemetery. Serving as pallbearers were Wallace Sanford, Teddy Berrong, Robert Anderson, Lee Lane, Mark and Perry Keen. NOTES: She was also preceded in death by her first husband William Andrew Summey, who died on September 19, 1932. She was the granddaughter of John Tedford Knight and Mary C. Young. Her son E.E. Summey is Ellison E. (Shell) Summey.